I have a thing about hands and feet. Especially hands. I love hands. (I love lamp.) When I look at other art models’ work I always look at what their hands are doing, and I’ve been told quite a few times that mine are very expressive when posing! Hands can be interesting in shots, to me at least; so I suppose it’s for the best (from a photographer’s point of view) that a tattoo artist refused to mark my thumb pad a couple of years ago with a little symbol I’d asked for, though I was quite annoyed at the time. Probably saved a lot of photoshopping over the years. This last week or so has been really nice – ultra sociable and busy, as I’ve been putting the effort in to trying new things and meeting new people (since 5 of my friends have moved away from my area in the last month or two; and after super life changes I really felt I needed to make my own changes!!). It’s been fun. I’ve started two new dance classes (ballet/stretch and tap, both of which I hadn’t done in a while, though the ballet teacher said to me ‘goodness, we’ll have you on pointe next week’, which was brilliantly ego boosting and made me feel like the proverbial three-year-old being patted on the back, beaming; yes, I’d sneakily pretended to be a near-beginner. I know; bad of me.) and advanced tap (with amusing burlesque style moves), which is just ridiculously fun, militant and fast paced with no mercy – very good for cardio. I’ve been out for drinks a few times, including once with a friend I hadn’t seen since primary school (but who had given me advice on Mexico last year, since she’d been living there), invited Holly Ivory Flame over to come blackberry picking & nattering with me around the woods near my house (foraging!!! Love it! ), and I’ve even joined a ‘meet up’ group and met an amazing (and mad) group of girls last night over a cocktail or three, with book club talks in the running too (all the current book clubs in Oxford seem to be reading incredibly boring books, so we agreed we’d veto those). AND I’ve started a new blog, more writing-based and fewer pictures-of-myself-naked orientated; a series of epiphanies about ‘growing up’ and ‘things I think I know’ about life, truth, art… etc. ; that way, I get a writing platform and you lot don’t have to read quite so much of my un-industry-related waffle (like this) here (though there might occasionally be some overlap). Win win. I might link to it on here sometime soon-ish, so that if you want to follow me there as well, you can. I’ll let it grow a bit first though. The following set of images were taken on film by photographer Steven Billups, during our visit to a ruined castle near Pforzheim in Germany. Steven is great to work with and I think these are very gentle and peaceful. One of them sold quite quickly after they were developed! I like the movement of my hair in the last. Showing lots from the same set here, and I’m really looking forward to seeing the ones we made in the beautiful Black Forest. – CASUAL/COMMERCIAL: I’ve got a great wardrobe, from snuggly warm knitwear for beautiful glowing portraits, to sports clothes for fitness/stock shots, glamorous and sophisticated evening dresses… and I can smile on cue with no awkward grimaces in sight! – STYLISH GLAMOUR/BOUDOIR: I have an excellent range of lingerie with varied colour and textures, and have a classic look perfect for shots which are more classy than seedy. – WORLD/DANCE: Did I mention my highly eclectic wardrobe? I’ve been a gigging bellydancer and along with my travels have amassed an array of eye-catching garments/costumery for extra-special themes. 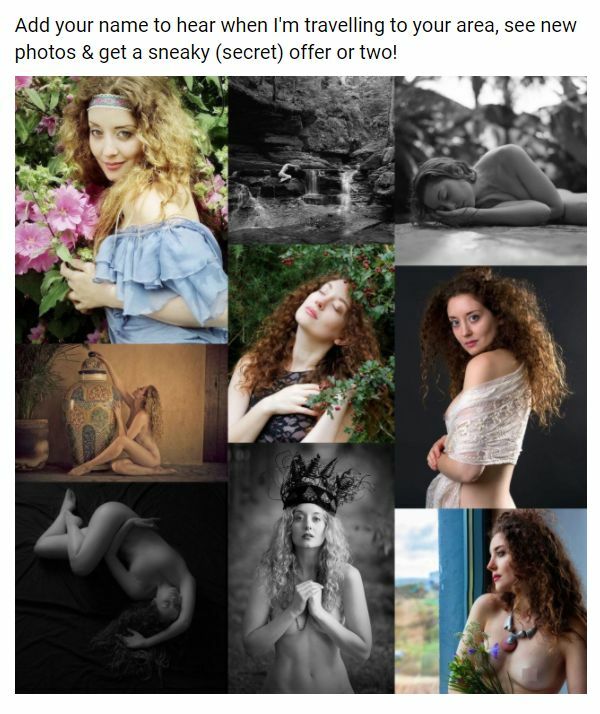 – TUITION/WORKSHOP DEMONSTRATIONS: I’ve done a lot of these, with national photographic bodies as well as very highly regarded photographers, so am completely comfortable and relaxed in these settings. I love to work with photographers, painters, designers and artists of various media, whether they be amateur hobbiests or experienced industry professionals, working indoors or out (I’ll happily recommend studios), for exhibitions, publication, portfolio building or commercial projects. Other than in studios, I’ve worked in ancient forests, lakes and waterfalls, derelict buildings, ruined manor houses and beautiful modern hotels, against famous city landmarks, in cobbled colonial streets and in flower gardens, in the sea, on the beach and in swimming pools, up mountains, in snow, on rockfaces and on the tops of cliffs. I am represented by commercial agencies here in the UK, but take most bookings directly. I have worked with world-class, award-winning photographers, yet many of my favourite images were shot by beginners with a drive to create something special. My goal is to inspire, to bring into being something that will last and which I can be proud of, and to be the catalyst for expressive and eye catching artwork. When working with me you’ll find that I’m confident enough in my strengths to deliver, while collaborating and listening to you with the aim of bringing your ideas (however vague or particular) to life. I welcome new ideas, concepts and experiments whole-heartedly. Thanks for reading! 🙂 That email address again: ellarosemuse@live.co.uk. Like the shapes you are making in this grest location Ella. Lovely! FAvorite? It's a tossup between #2 and #5… for reasons I am certain you will understand – your body is truly an extension of the tree in both shots.